Historically, Buddhism was incorporated into Russian lands as early as the late 15th century, when Russian explorers travelled to and settled in Siberia and what is now the Russian Far East. The main form of Buddhism in the Russian Federation is Tibetan Buddhism, the major sub-sect of the greater Vajrayana Buddhism. Although Tibetan Buddhism is most often associated with the peoples of Tibet, in the north the sect spread into southwestern and northern China, Mongolia, and finally Russia. In the south, it took hold in Bhutan and parts of northern India and Nepal. Afterwards, it began to spread into the geographically and culturally adjacent Russian constituent regions known today as: Amur Oblast, Buryatia, Chita Oblast, Tuva Republic, and Khabarovsk Krai. There is also Kalmykia, another constituent republic of Russia that is in fact the only Buddhist region in Europe, perhaps paradoxically located to the north of the Caucasus. Tibetan Buddhism is primarily practiced by the indigenous peoples in these various regions of central and eastern Russia, except for a few Russian converts based mainly in the larger cities such as St. Petersburg or Moscow, where there is greater access to urban Buddhist centers or facilities of the like. The other major form of Buddhism found in Russia is the more commonly known Mahayana Buddhism, primary practiced by the Vietnamese or Chinese immigrant communities based mainly in the large cities. The Russian Federation, and perhaps strangely, Austria are the only two European states today that recognize Buddhism as an «official», though not necessarily «state religion» in their respective countries. On top of that, Russia also recognizes it, along with Islam, Judaism, and of course Orthodox Christianity, as native to Russian soil in the 1993 Constitution of the Russian Federation. All other religious groups are unrecognized, and must officially register and be subject to rejection by the state. There are a few dozen Buddhist university-monasteries throughout Russia, but concentrated in the Russian Far East and Siberia, known in Russian as Datsans. 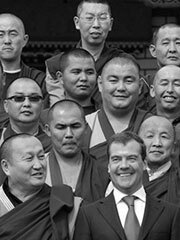 Adherents to Buddhism account for approximately 700 000 in the Russian Federation, about 0.5% of the total population.